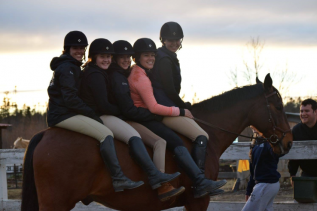 As a show team, we compete in the Intercollegiate Horse Show Association in Zone 1, Region 2. 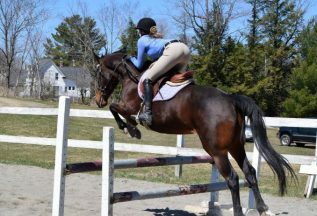 Our region in IHSA currently offers eight different levels of Hunt Seat Equitation and Equitation Over Fences: Open Fences/Flat, Intermediate Fences/Flat, Novice Fences/Flat, Advanced Walk, Trot, Canter, Beginner Walk, Trot, Canter, and Beginner Walk, Trot. The team does accept riders of all riding levels and disciplines. The team has competed for years in IHSA shows and has perfected the art of learning, sportsmanship and fun. The team has use of our coach’s horses in order to improve horse handling, riding and knowledge skills. The team hosts tryouts at the beginning of the fall semester. Our coach assesses new riders to determine what level is best for them. Riders in Walk-Trot through Open Jumping all have an equal chance to compete in shows and participate in practices. 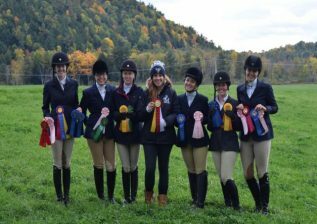 The Equestrian Team has much to offer athletes in playing an active role on the University of Maine campus and local community as well.